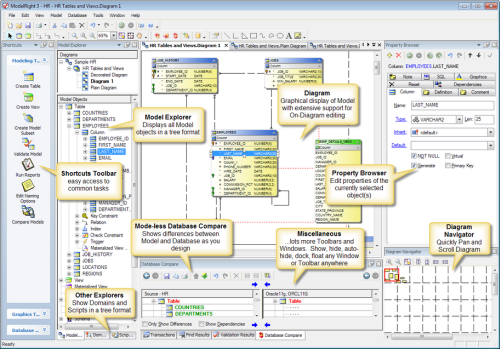 ModelRight 3 radically simplifies the development of your database design in Oracle, SQL Server and MySQL. It will help you to visualize and manage the complexity of your database and create a solid database design. ModelRight 3 can also help you enforce complex constraints, manage database views, validate design decisions, and create complete CREATE and ALTER scripts. It has been developed from the start to support many of your database’s most advanced features, without sacrificing intuitive ease of use. It combines all the standard features like drag/drop, undo/redo, reporting, printing, on-diagram editing, etc… with powerful and advanced design features like Domains, in-depth database-specific support, scripting, and comparisons with your database or another Model. We are convinced that it is the best database modeling product available today at any price. It is the answer when you need a database modeling tool that surpasses the “least common denominator” approach taken by others. The best part of it supports a whole range of popular database systems such as Oracle 8,9,10,11, SQL Server 2007 and 2008 and MySQL 5 and 6. There’s also a free community edition available here.